As Toolmonger cyclists probably already know, a recumbent bicycle offers several advantages over the normal upright sort, but they’re generally rather pricey. We’ve recently posted on tube bending, mitering, and welding, and this project requires all those new tools you wish you had an excuse to pick up. If you’re one of the Toolmongers who can pull designs from a picture, I’ve included one above. 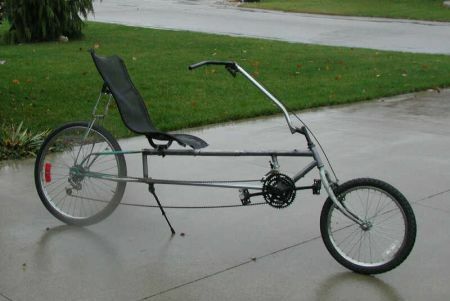 For the rest of us who need plans to work from, I found a site by A.D. Carson with good advice and plans on building your own recumbent bike from two unloved upright bikes — and check out these notes if you need a tandem. At the very least, you can reduce the space occupied in your garage by two bikes down to one. If you want to research your own design, you’ll find lots of options here. Pictured above is James Neely’s DIY version of Carson’s recumbent plans. Hmm, looks like I ought to check my page for dead links again…. Alan, I’m just happy that any of the links work. I had lots of fun checking out all the Stuff! The fact that you had compiled a bunch of information helped me enormously as I was looking for plans I want to use. I think I’ve got the tools together, and now I just need to find the bikes and the time…. Then there’s also the fact that it made great material for the post. I have been looking for recumbent bike plans. I have looked at the bike that is on your website, but was unable to download them. Is there a web address to go to ?